Well, saw this awesome cartoon in todays Hindu that showed a doctor/scientist standing and thinking about his just created monster. 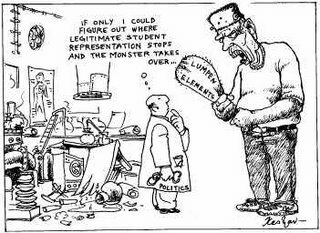 Thinking where the legitimate student representation ends and where the monster takes over. Its true, so many of the so-called protests are nowadays politically motivated to such an extent that they are used by political parties for short-term gain. Makes me think that its better India never have a student uprising anyday!!. I would say that even the anti-reservation protests are politically motivated and drawn by strings from some shady puppeteer somewhere...I am certain that all these end in the hands of some dirty, fucked up politician, swimming in dirt and grime, licking his ugly hands in glee. Beware! all yes students, look around. Make a stand.!! but who listens machan? nobody is ready even with so much 'awareness'...we are just another "minority"
'Cause I want to be the minority, hey! "Down with the moral majority"-dont we all love to do away with it? We will actually have a lot to talk on these kind'a topics until what we call a revolution takes place. But there again is a question... Who is going to lead?? ?